I've had a more chilled out day today, I just went to the beach and watched TV at home. My friend is coming over in a bit to catch up, we haven't seen each other in a while so we're going to get food and watch more TV! I've got one more of my Dutch nail polishes to show you today. My Dad bought this for me when I went to visit him and I love it so much! This polish is by KOH Colours! (their exclamation mark, not mine) and the shade is called Metallic Green! (again, not my exclamation mark...) I'm not sure why this is called metallic because it's holographic, but who am I to argue with these companies? I can't stress enough how awful this polish is to apply. The worst formula I've ever used... EVER! Even with Nubar Ridge Filler as a base coat (I use this for all my holos) it was so patchy. Even if I let this dry completely between coats, the polish still moved when I applied the next coat. This took four coats to apply and then I put on a fifth just to make sure it was even! When this was still wet, it looked like clay and not remotely holographic, but when it dried... WOW, this was bright! Blindingly holographic and hands down the best I've ever used. It's like a mint green version of GOSH Holographic which is one of my top polishes to own, but one I'll probably never have! The photos you can see below show five coats of Metallic Green! with no top coat. 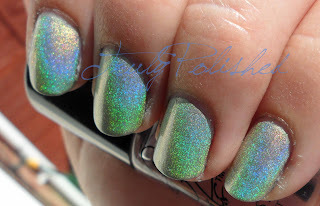 For more pretty photos, click "Read More"
One of the things everybody seems to comment on is the fact that topcoat seems to dull the holo effect. I thought I'd try this out so I put a coat of Cult Nails Wicked Fast on top. Before it dried, it dulled the effect completely, but when it was dry I couldn't see a difference. Here's a photo. I have Wicked Fast on my index and ring finger. And just and extra photo. I love the end part of the holo spectrum, with the blue and purple, we never see that bit in the photos! This is an amazing polish! I got this at Douglas in the Netherlands for €14.95 so if you're over there, this is one to get!!! I wish all polishes were as good as this to look at! This is so pretty! It looks great on you. Have you tried any of the Layla holographics? They have a terrible formula too but the holo effect is the strongest I've ever seen. Thanks! No, I haven't tried them yet. 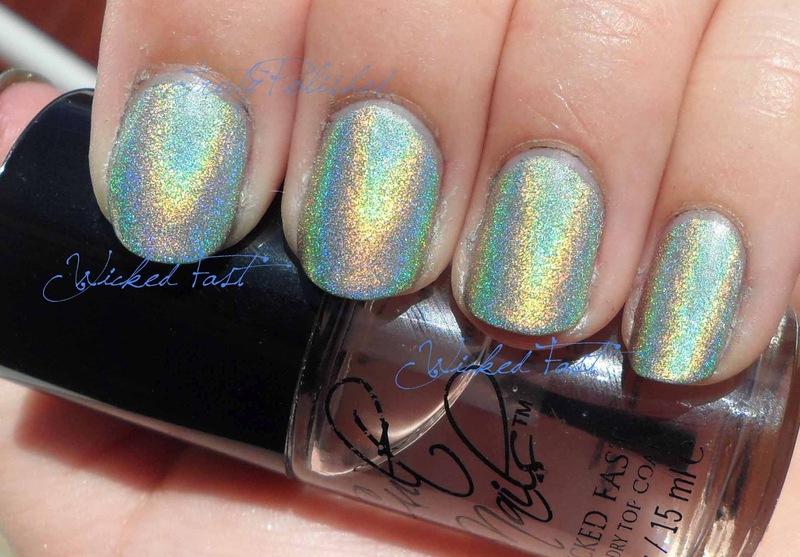 I had a look for them in Malta but they only had the Layla Magnetics and not the holos! I've seen swatches and I'm dying to get them, they look amazing!